PERFECT LOCATION TO LIVE YOUR SALT LIFE! 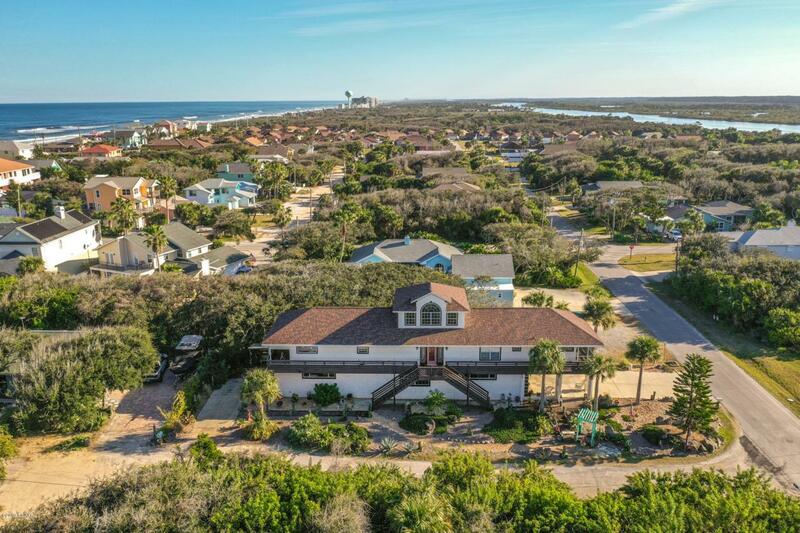 3 Bedroom 3 Bath Beach home sits HIGH & DRY, nestled between the Intracoastal and just 2 blocks to the beach! Bring your recreational vehicles for this RARE FIND 4 CAR OVERSIZED GARAGE in Flagler Beach. 1st floor mother-in-law suite with it's own private entrance is a bonus feature for sure! The main living area is an open floor plan with soothing coastal colors and lots of natural light, built in shelves, rounded archways, niches and plant shelves. The bright kitchen and dining area flows to the Florida room that offers a wet bar and Jacuzzi, a great space for entertaining. Character and charm surrounds you in this unique beach-side treat! Spacious master suite with boutique sized closet, a large double headed walk in shower, dual vanity sinks.Screened balcony overlooking the preserve to enjoy incredible views. Generous sized guest room and bath adds another full Jacuzzi tub and shower for maximum comfort for guests. Buy now, smile later! Newer roof (2017) and newer A/C unit (2014) and Beautifully landscaped on a corner lot. Balcony 100' x 4'. NEVER FLOODED!!!! Hurricane shutters on front and back of house only. Three large walk in closets.